Durham Modern Flotation System with Fast Free Shipping! The Durham is a charming, simple design using varying materials. It has metal grills finished in a textured Matte Black - for long life and care-free maintenance and sturdy solid-wood posts. The posts are finished in Walnut, a medium tone wood color which will blend with many decors. 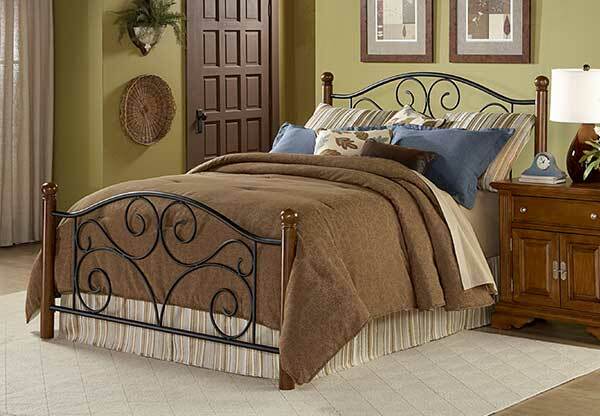 The Doral's clean, unadorned design makes it the perfect neutral base on which to build your bedroom. The Durham Flotation System includes: Headboard, Footboard, Frame, Support Rails, 8" deep plush-top soft side mattress and 9" foundation for a complete modern flotation system. Available in Queen, and King sizes. The Durham Panel Bed System Includes: headboard, footboard, side rails, premium full depth 8" mattress and foundation for a complete flotation system. The Durham Panel Bed Includes: headboard, footboard, side rails. (Does not include mattress).